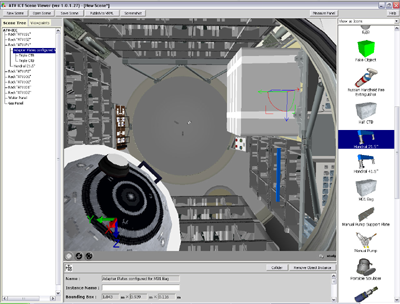 The ATV Intravehicular Configuration Tool is a 3D-powered editing tool that allows the effective planning and maintenance of the cargo storage of the ATV. It is currently used in the ATV Mission Control Center in Toulouse. Arranging cargo storage items and tools inside the ATV is an extremely complex task: a variety of items of different shapes, sizes and purposes should be placed into a confined area providing easy search and access to stored items during the mission. All procedures associated with the cargo require detailed planning. To increase the efficiency of the logistic planning and execution processes, ESA commissioned ParallelGraphics to develop the ATV IntraVehicular Configuration Tool (ATV-ICT). The ATV-ICT is composed of 2 separate applications: the Object library provides an expandable library of 3D items derived from the ATV CAD models, which allows the import of new items, examination and update of the object properties. Each object contains also one or more snap points that describe its dynamic behaviour when dropped into the scene (for example the hand rails can be placed and moved along the seat tracks of the racks). 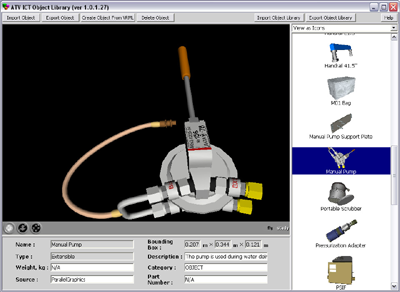 The objects available in the library comprise: CBTs of different sizes, EDV, hoses, electric and manual pumps, adapter plates, hand rails, etc. The ATV-ICT Scene Viewer is easy-to-use tool for stowing cargo containers and creating screenshots from 3D scenes written in VRML. The 3D window of this application represents the Integrated Cargo Carrier (ICC) internal module structure. The structure includes racks, panels equipment, aft and forward cones, foot restrains, the Water Control Panel (WCP) and the Gas Control Panel (GCP) structures, plugs, various subsystems, except the service module. By using objects from the Object library it is possible to stow containers and other equipment and tools inside the ICC module. Since the objects dimensions of the models reflect the real hardware sizes, by means of the Scene Viewer the user can virtually analyse the benefits of different layouts combinations and asses envelopes clearances, measure distances and produce examples of 3D cargo maps. The tool also allows the export of the VRML models to the Virtual Training Editor where SCORM compliant 3D interactive training material is developed to dynamically support the cargo operations by creating virtual procedures (e.g. loading and unloading procedures, water and gas transfer’s procedures).